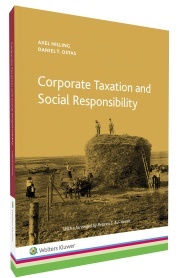 The book Corporate Taxation and Social Responsibility explains in a simple and accessible manner the challenges facing today's international tax regime, and it presents possible solutions to meet these challenges. Find out more about Corporate Taxation and social responsibility in our article or at the product page. Order from within Sweden? Go to our webshop. If you are a customer situated outside of Sweden you can order the book by sending an e-mail to our customer service and you will be assisted. The e-mail address of our customer service is kundservice@nj.se. The book will immediately be sent to you after we have assisted you. All prices are exclusive of VAT. VAT is 6% on books, booklets and magazines. For electronic products such as CD-ROM and software, VAT is 25%. Shipping costs will be added. Note that the price in USD and EUR is approximate since the price is invoiced in Swedish crowns (SEK). Note that the shipping cost in USD and EUR is approximate since the shipping cost is invoiced in Swedish crowns (SEK).